The beautiful English actress Rhona Mitra stars as Sonja in Underworld: Rise of the Lycans, the prequel story of this popular modern horror series. The story takes place several centuries before the “current” films which is set in the Dark Ages and tells how Lucian became the founding father of the Lycans. Originally, the Lycans were mindless and unorganised werewolves, however Lucian inspired them to band together in order to break free from their oppressors, the Vampires, lead the nefarious and domineering Viktor (Bill Nighy). Early in the movie, we learn that Lucian has more rights than other Lycans, thanks to his master Victor, however when he learns that Lucian and his daughter Sonja are in a relationship, the war between the Werewolves and Vampires erupts. Although not as entertaining as the original movies, the prequel does give the viewer what they want, more of the Underworld Universe which gives us a great insight into both sides of the story. The acting may be forced and contrived, however the action and special effects transcend this problem, making this an enjoyable yet forgettable journey. On blu-ray, the video quality is outstanding, thanks to the 1080p resolution and surround sound. 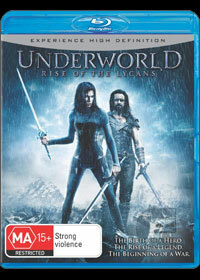 Matched with a plethora of special features, Underworld: Rise of the Lycans is a reasonable purchase for fans of this series. Definitely one to investigate.